Despite taking time out to let Johnny Depp recover after injuring his hand last month, production is still taking place on the fifth installment of the Pirates of the Caribbean franchise, Dead Men Tell No Tales, and to celebrate Mr. Depp's return to the Australian set, producer Jerry Bruckheimer tweeted the first image from the film, featuring Captain Jack Sparrow in a tight spot. Despite a disappointing fourth installment, Pirates of the Caribbean is a franchise I still absolutely love, and the fact that directors Espen Sandberg and Joachim Ronning seem to be going back to the series' weird and wonderful roots (just take a peek at the below synopsis if you don't believe me), and Javier Bardem has signed on as the movie's big bad, has me really confident that this will put the franchise back on course. 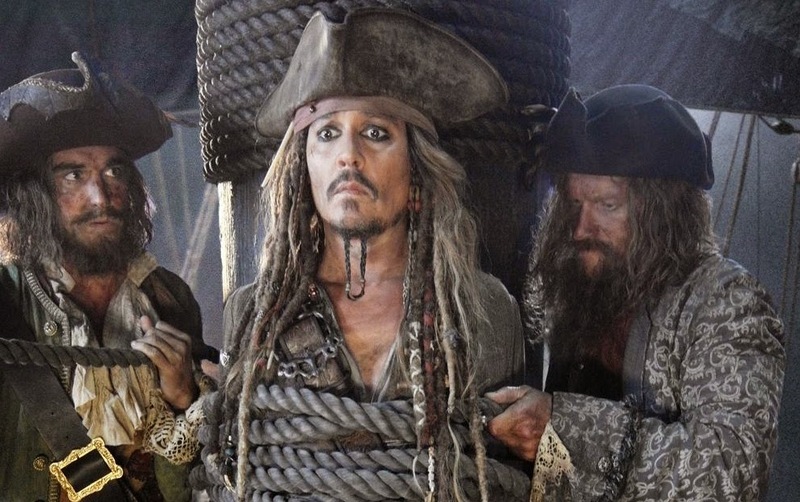 Synopsis: Thrust into an all-new adventure, a down-on-his-luck Captain Jack Sparrow finds the winds of ill-fortune blowing even more strongly when deadly ghost pirates led by his old nemesis, the terrifying Captain Salazar, escapesfrom the Devil’s Triangle, determined to kill every pirate at sea…including him. Captain Jack’s only hope of survival lies in seeking out the legendary Trident of Poseidon, a powerful artifact that bestows upon its possessor total control over the seas.